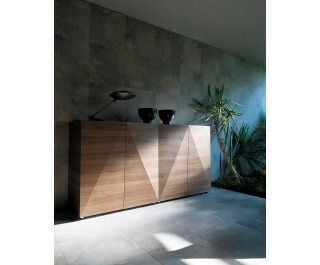 Not Riddled features a set of diamond-shaped doors that can be operated without hinges. Steven Holl has managed to shape a wood-fabric piece that through small, laser-inscribed incisions, can be folded in an origami-like fashion, holding the container sides. Not Riddled is the sublimation of a contemporary and intelligent application of mechanical innovation. Structure made from melamine-coated and lacquered particleboard. The thickness of the structure is 18 mm, the back panel 10 mm, and the fixed central divider 36 mm. Sides and doors made from a material designed and patented by HORM, composed of a sandwich of wood and fabric 2.2 mm thick, which, thanks to a number of superficial incisions made with a laser cutter, can be folded up like origami. Door frame made from solid walnut. Neodymium magnet protected and hidden by the wood used for the door closure. Shelves made from tempered transparent glass, with polished edge, 5 mm thick. PVC or felt bumpers. Painted ABS adjustable feet with aluminium finish. The doors of the storage unit do not have metal hinges to fix them to the structure. The hinge function is performed by the fabric inside the door. The doors have been subjected to 50,000 opening and closing cycles and passed the test for: “Durability of doors UNI 8607:2005” with flying colours.